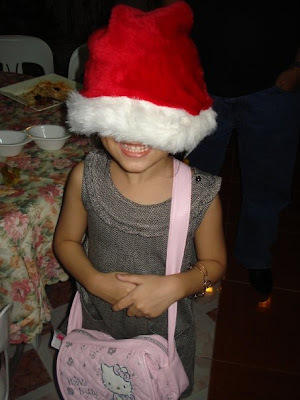 I hope you and your family had a great Christmas celebration. We spent ours the usual way with close family members. It was just dinner, then a rousing game of Guesstures (boys vs. girls -- girls won, of course!) followed by mass then more food and presents! The kids were ecstatic -- Santa really followed thru with their wishes this year (yay mommy! he he). 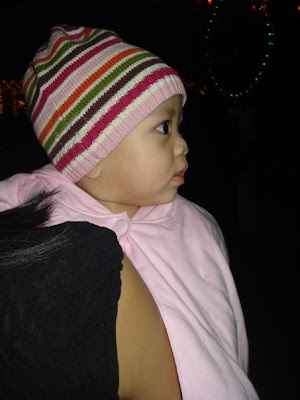 Below is a picture my cousin took of Lucia with her beanie and pink cape (it was a bit cool that night). Too bad the view's on the side. She's 7 and a half months old now and crawling pretty fast. She's also mastered pulling herself up (sometimes with her mouth -- ha ha ha!) and has taught us to get everything we don't want to end up in her mouth out of the way. This includes fingers and hair. Now we have New Year's Eve to look forward to!